Plight of the Paralympians: This is what they were being told to expect in September 2012. 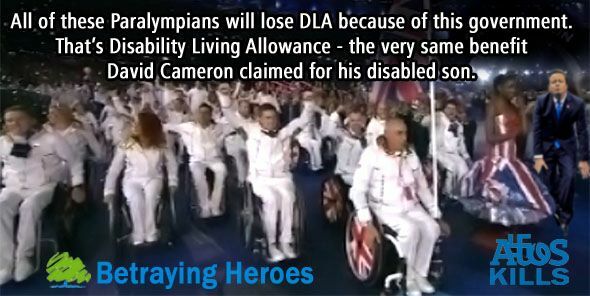 Two years ago, Vox Political warned that the legacy of the London Paralympics would be the loss of disability benefits for the British athletes who took part. Gratitude goes to Tom Pride for drawing attention to the plight of basketball player Jon Pollock, who has been refused any benefits at all since he became unemployed after the Games. How true those words were. On the website Inside the Games, Mr Pollock said: “”I retired after London and since then I’m not entitled to benefits because lottery funding isn’t taxable. British Wheelchair Basketball says Mr Pollock declined support that was available, but this seems questionable. If you have a choice between spending two years looking fruitlessly for work and accepting help to plan a career after sport, you’d take the help – unless it wasn’t worth having, which would be par for the course with our useless unelected government. Why aren’t ministers queueing up to tell us how well the UK treats disabled people who could have had normal careers but chose to represent their country instead? They’re nowhere to be seen – because there isn’t a photo opportunity involved. Just when you think you’ve seen the lowest the Conservatives can go, something happens that is completely beyond the pale. Yesterday a message was posted to David Cameron’s Facebook page from a person who said they were going to commit suicide because they had been wrongly sanctioned. This serious disability hate remark has been allowed to remain ever since – on the Prime Minister’s own Facebook page, which we are led to understand is overseen by professionals who, let’s not forget, paid for people to visit it and press the ‘Like’ button in order to make him look popular, and who may reasonably be expected to moderate such offensive behaviour off the page before it causes any real harm. You can read more details on the Atos Miracles Facebook page. “I am in receipt of ESA. I am trying my best to get better. I want to get better as I fully believe I have a lot of offer. However I am being continually lied about because when I ask for help I find a lot wrong with the system. Mainly due to the unfair cuts imposed by your government to public sector services and … as a consequence I have not got any better in fact I have got worse. A lot worse. To the point I no longer want to live anymore. If you had seen this on Facebook, would you have told the author to “get on with it then”? Or would you have sent a message of support and tried to get them the help they need? The rational choice would be the latter. If you had been overseeing that Facebook page, would you have allowed such a dangerous comment to remain or would you have removed it and reported the sender? The very least that could have been done by the Tory overseers of Cameron’s page would have been to check up on the Job Centre advisor mentioned in the post, whose response was just as bad. “He did inform me it was my choice to take my life” – that person should have got in touch with the relevant authorities and rallied help, but no. It seems some people will do anything for a “positive benefit outcome”. I’m told the person who wrote the message has been found and is safe and well – no thanks to the Job Centre, to the inhabitants and moderators of David Cameron’s Facebook page, or to Cameron himself. He should be utterly ashamed. But he probably doesn’t even know this has happened. 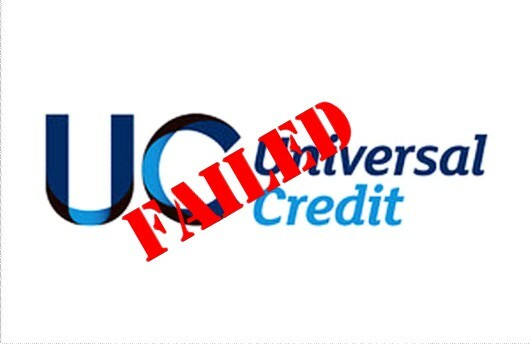 Shame on you, Job Centre! Getting people off the dole isn’t getting them into work! It is as though they were prescient and could predict the way the debate has developed this week, firstly with the bogus DWP press release that has allowed some of us to suggest that we should judge the DWP by results, not targets; and now with the declaration by the Commons Work and Pensions committee that Job Centre Plus staff should be rewarded for the number of people they get into work, not just the number they get off the dole. It seems this is an idea whose time has come. Employment minister Esther McVey’s time – like that of her boss Iain Duncan Smith – has been and gone. Do not expect her to do anything about this. Job Centre staff are currently given incentives to get benefit claimants off the dole, and this has led to wholesale abuse of the system of sanctions which can mean people are banned from claiming benefits for three whole years after a third ‘offence’. 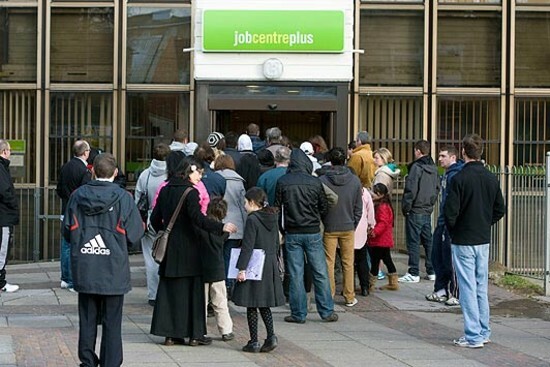 People have been sanctioned because the dates on which they applied for jobs did not tally with the number of jobs they were supposed to seek every week – as the Job Centre week starts on Tuesday. 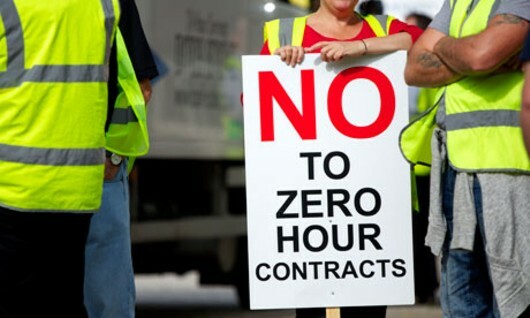 They have been sanctioned for arriving late at their signing-on appointment – because a job interview overran. They’ve been sanctioned because they didn’t apply online for a job, as advised, because the job had ‘expired’. They have been sanctioned while on Workfare because signing on – as advised by the Job Centre – made them late for the placement. They have even been sanctioned for failing to apply for jobs, after they had succeeded in getting a job. The Work and Pensions committee has diplomatically described this as a “haphazard” approach to assessing claimants, saying many were referred for sanctions inappropriately, or “in circumstances in which common sense would dictate that discretion should have been applied”. Common sense has no place in a Job Centre overseen by a Conservative-run DWP. The people who work there are under the cosh, just as much as the claimants. They have a target to meet – five per cent of jobseekers off the books every month, unless I am mistaken (perhaps readers could provide the correct figure if I am). Sanctioning rates in the year to October 2012 stood at 4.2 per cent, so staff were failing to hit this target – but after a sterner regime was introduced in that month, sanctioning increased to five per cent. The system has been particularly cruel on younger claimants. In the year to October 2012, the sanction rate for those aged 18-24 was eight per cent, per month. The number of sanctions in the year to 30 June 2013 was around 860,000 – the highest number in any 12-month period since statistics began to be published in their present form in April 2000. The committee also said the DWP needed to monitor financial hardship suffered by claimants who lose their benefits. This could include publishing information on the number of claimants “signposted” to food banks by Job Centres and the reasons given for this action. It is as if Dame Anne Begg (who chairs the committee) has been reading this blog. Readers will know that part of Vox Political‘s Freedom of Information request about incapacity/ESA claimant mortality referred to the well-being of those who had been thrown off-benefit altogether. I can tell you now that the DWP does not monitor what happens to these people, nor does it have any plan to do so in the future. They are thrown to the wolves. Dame Anne was quoted in The Guardian, saying: “JCP must be very clearly incentivised to get people into work, not just off benefits. This is exactly what Vox Political has been saying since Rachel Reeves described Labour’s compulsory job guarantee policy on finding work for claimants, last week. Reeves’ words were derided by visitors to certain blogs who said she was as bad as the Conservatives. Now that some flesh is appearing on the bones of her strategy, we can see that this was undeserved. According to the BBC, ministers cited the recent fall in unemployment to say the system was working, but they failed to mention what their intention was. Was it working in getting people into jobs? Or was it only working in getting people off-benefit, as claimed by the committee? If people were going into jobs, were they real jobs, or fake “self-employed” jobs of the kind that the BBC itself investigated last year, intended only to get claimant numbers down? What about the rise and rise of Workfare schemes, in which claimants are knocked off the unemployment statistics but continue receiving an equivalent amount to JSA – from the DWP – for a full week’s work, effectively subsidising commercial firms? It seems likely that ministers will be reluctant to answer those questions. While institutions like the BBC are determined to broadcast inaccurate stories based on falsified figures supplied by those ministers, it seems they have no incentive to do so. Vox Political cannot continue to expose these issues without funds! A Freedom of Information Request (FOI) by Plaid Cymru has discovered that jobseekers could face benefit sanctions if bad weather (including snow) prevents them from attending a Jobcentre appointment. Plaid Cymru asked the Department for Work and Pensions (DWP) whether exemptions would apply to the policy of applying benefit sanctions against unemployed people who fail to attend Jobcentre appointments due to poor weather conditions (such as snow), or other unforeseen circumstances. Read the full article by the Welfare News Service here. The Department for Work and Pensions is heralding the result of a new poll as proof that a large majority of people support its controversial Bedroom Tax policy – in fact the findings prove nothing of the sort. Headlined (incorrectly) ‘Poll shows support for removal of spare room subsidy’ – there is no such thing as a spare room subsidy so it cannot be removed – yesterday’s press release relies on some not-so-subtle wordplay and the gullibility of the reader to make its case. If you want to find out how many people supported the government’s policy, you’ll have to look somewhere else because it is not directly identified anywhere in the article. “New independent research shows there is strong public support for reducing under-occupation and overcrowding in social housing,” it begins – and this is fair enough. People do indeed want to reduce under-occupation in social housing – but we have seen, time and time again, that people think there must be adequate social housing available for people who want, or need, to move. This is not what the Conservative and Liberal Democrat government are offering. Instead, people are being told they can either move into smaller, privately-rented accommodation that will create more expense for the government, or if this is unavailable, pay the Bedroom Tax at 14 per cent of their eligible rent for one room and 25 per cent for two or more. Whatever they do, they end up having to pay more. That is not reasonable. “In a poll [of 2,021 people] conducted by Ipsos MORI, 78% of respondents said they thought it was important to tackle the problem, which has led to nearly one-third of social housing tenants who receive Housing Benefit living in homes that are too big for their needs,” the article continues. What problem is this, then? The problem of people occupying social rented properties that are too large for them, as the ConDems want you to believe? Or the problem of successive governments failing to build social housing that is adequate for the needs of the population? The latter seems more likely, don’t you think? None of the information around that 78 per cent figure suggests that 1,576 people support the Bedroom Tax. I happen to believe it is important to tackle the bottleneck, in order to relieve the overcrowding issue. The Bedroom Tax won’t do that, though. It will just take money from poor people. Was support for the Bedroom Tax indicated anywhere in these results? No. The closest we get is: “The polling also found that 54% agreed that it is fair that people of working age, who live in social housing, should receive less Housing Benefit if they have more bedrooms than they need.” Even this does not suggest that those questioned agreed with the amount the government is taking from hardworking social tenants. There are a couple of points to make here. Firstly – there is no policy to remove the spare room subsidy because, as previously mentioned, the spare room subsidy has never existed. Secondly, the idea that people can find work (or find better-paying work) is a bad joke. Only yesterday, a staffer at my local Job Centre was heard admitting that their office had received no new job advertisements in several weeks, and there is no evidence that this is a unique case. It is unrealistic to suggest this as a reasonable way out. The fact that both these questions received 54 per cent support leads one to question how many of the respondents were affected by the Tax. My guess would be 46 per cent or less. The other 46 per cent, of course. DWP ministerial rentamouth Esther McVey was on hand to provide the commentary (Iain Duncan Smith is still in hiding, one presumes). She said: “This shows that the public agree that action was needed to tackle overcrowding and to make better use of our housing stock.” Except, as already pointed out, it doesn’t show that the public agree with the government. The Bedroom Tax will do nothing in this respect – in fact, the bill may increase (people moving into private rented property would receive more benefit, and people who have been evicted because they can’t pay their bills after the Tax was imposed will be a burden on councils, who will have to put them up in more expensive B&B accommodation). Also, increasing numbers of working people are being forced to claim housing benefit because companies are making sure their wages are too low to provide a decent living. Almost a million working people were claiming housing benefit in May this year, and that figure seems sure to have been exceeded by the time the next set of statistics is released on November 13 (Wednesday). Apparently it is bad for unemployed people to claim the benefits they deserve, but perfectly fine for companies to have the lousy wages they pay topped up at the taxpayers’ expense. That’s government doublespeak for you! Why blame the civil service, Mr… Smith? They only do what you tell them to! 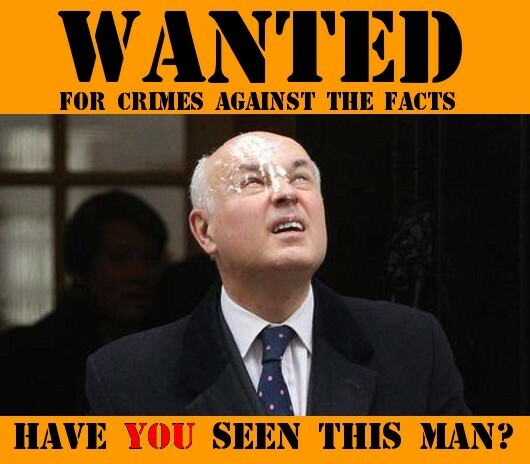 Isn’t it a shame for the Tories that they hung their ‘welfare’ ‘reforms’ on an incompetent like Iain Duncan Smith? Accused of wasting £140 million of taxpayers’ money on his white elephant Universal Credit scheme (or is it scam?) he can at least take comfort that the latest report followed his lead and fell back on what is now becoming a Conservative Party Standard Excuse: Blame the civil service. That won’t wash, though. The real reason, as detailed in this blog previously, is lack of interest by Conservative Party ministers like Smith himself. We call him ‘RTU’ because we believe his incompetence as an Army officer led to him being ‘Returned To Unit’ and eventually shuffled out of the service and it is this history that seems to be repeating itself here. Let’s have a look at the “alarmingly weak” management for which the Secretary-in-a-State was rightly criticised by the Commons Public Accounts Committee this week. We know that the project is now well behind schedule, despite protestations to the contrary from RTU and the Department for Work and Pensions. A planned pilot roll-out in April was restricted to just one Job Centre, where they handled only the simplest cases, working them out on spreadsheets because the IT system is open to fraud. Since then it has been started in Hammersmith, in London, where its success or failure is not yet known. It is now doubtful whether the project can still be delivered, on-budget, by its 2017 deadline. If it is, what kind of service will it provide? Of the £2.4 billion set aside, £425 million has already been spent and a sum between £140 million and £161 million is likely to be written off, depending on whose figures you believe. We know that a secretary was allowed to sign off £23 million worth of purchases because RTU’s systems were so lazy. Does anybody even know what this money bought? “From the outset, the department has failed to grasp the nature and enormity of the task; failed to monitor and challenge progress regularly; and, when problems arose, failed to intervene promptly,” said Public Accounts Committee chair, Margaret Hodge. She described the system’s implementation as not only poor but “extraordinarily” poor. And she said the pilot scheme was not a proper pilot, as “It does not deal with the key issues that universal credit must address: the volume of claims; their complexity; change in claimants’ circumstances; and the need for claimants to meet conditions for continuing entitlement to benefit”. The report by the committee singled out the DWP’s permanent secretary, Robert Devereux, for particular criticism, saying he only became aware of problems in ‘ad hoc’ reviews, because reporting arrangements were inadequate and had not alerted him to problems. Even after he knew of major problems, he did not closely monitor the project, the report stated. It seems Conservatives on the committee wanted more criticisms to be included, and The Guardian has stated that senior Tories have said they would accept Devereaux’s resignation, if offered. Let’s face it: we’ve been here before. Michael Gove’s Education Department is now in a terrible mess because he brought in a gang of “advisors” to operate “above” his officials – who have meanwhile faced huge cuts in their workforce and a disastrous fall in morale. Gove brought his ignorant mates in to force their foolishness on the professionals, as this blog reported in June. 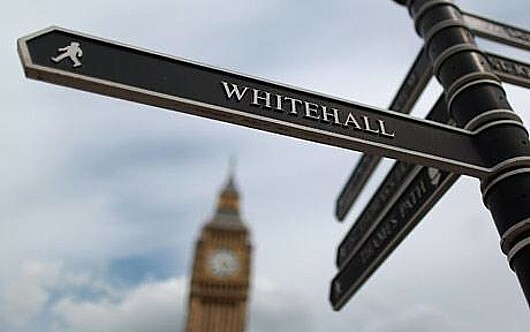 That was when The Spectator weighed in against the civil service, lodging an advance claim that if Universal Credit flops it will be due to the civil service, but if it succeeds it will be a victory for Tory ministers alone. Civil servants do what elected Members of Parliament tell them to do. They pay attention to the wishes of their political leaders and apply their considerable expertise to the problems set for them, in order to produce the required result, within budget, while complying with the strictures laid down by those political leaders. They are very good at their job. If they are failing, then the problem must lie with the politicians. If a goal is unrealistic, then blaming the ‘help’ is totally unproductive – it only serves to make them hostile. And, let’s face it, we’ve all seen sheep with more intelligence than Iain Duncan Smith. *If you have enjoyed this article, you may wish to consider picking up the book, Vox Political: Strong Words and Hard Times. The site is not professional and receipts from the book are its only means of support. Its 350 pages contain a great deal of information that should be just as useful as this article, and it may be bought here, here, here, here and here – depending on the format in which you wish to receive it.